The Chamomile Exquisite Cream ($26 for 1.8 oz) evokes memories of middle school for me, (see the jean jacket I used for the pictures? I was super cool, just sayin’.) when Bonne Bell lip balm was around and everything from your hand lotion to your scratch n’ sniff Lisa Frank notebooks had the fragrant smells of bright flowers and the fruitiest of fruits. Now, of course, none of those items were in any way natural. But this cream is, and you’ll love the floral, bright scent. Jessica has formulated this sensitive-skin-friendly moisturizer to not only provide your skin with vital and effective moisture throughout the day, but with ingredients that I am always jonesin’ for! The scent of the cream is strong, but the lotion itself is not. As in: lots of times I find when a product has a strong smell, it also has a strong, harsh effect. Not so with this cream. It’s thin texture melts onto skin while you have an aromatic experience enjoying notes of rose, oranges and calming chamomile essential oils. The scent dissipates quickly after it absorbs into your skin, leaving you with soft, even, happy skin. Sussed up with calendula essential oil, vitamin E, and organic aloe (the first ingredient) this special potted cream is a winner for me, and definitely something I would purchase again. I take it with me when I travel as my skin has a tendency not to behave when I take a vacation (argh)! Fortified with vitamin A retinol palmitate, it helps bust fine lines and is vegan, gluten free, paraben free, and organic to boot. One downfall for me is that this product, and also the peel and the cleanser I mention below, contain the popular preservative phenoxyethanol, which gets a “4″ (moderate hazard) rating on the Environmental Working Group’s Skin Deep Database. Worth noting for all of your green beauties who are 100% purists! This peel ($16 for 1 oz) is described as “an intensive anti-aging and anti-acne resurfacing treatment mask packed with naturally occurring enzymes, antioxidants, plus alpha hydroxy and glycolic acids to provide thorough exfoliation and stimulate cellular renewal, while replenishing vital nutrients and beneficial moisture to the skin.” Woah, now! This is a mask I would use maybe 1-2 times a month. It is certainly effective in creating a tighter, brighter complexion, and the fall-centric pumpkin scent (hello, September!) is just to die for. Pumpkins are quite good for you skin, as luck would have it…not just good for pies. Mmm. Pie. No, the pumpkin carries 100 “skin food” ingredients, according to Jessica. Containing beta carotene, vitamin A and zinc, these inputs are known to stimulate your skin’s circulation and promote healing. I am happy with this product and am excited to use it more as I prep for my auditions this fall. A stunningly beautiful woman in her mid-50s who I met recently (at my own wedding, actually!) had perfect skin – taut and supple. I asked her what her regimen was and she told me that she just washes her face with soap and water and makes sure to give herself at-home facials, masks and peels a few times a week. Good enough for me. This one is now a part of my regular rotation! But take note that this product is not recommended for sensitive or reactive skin types. 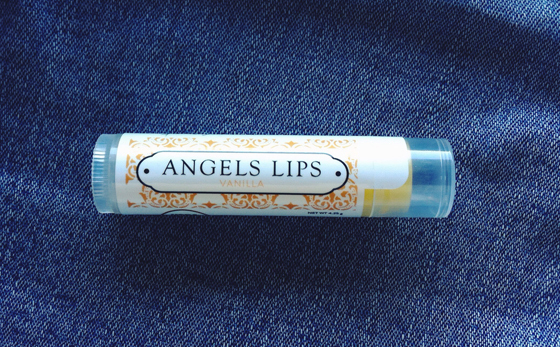 The Angels Lips balm in Vanilla ($6 for 4.25 grams) that I ordered was gone far too soon, and was a big staple for me in my purse until it was down to a nubbin. (Or did I eat it? Don’t remember…) Goes on smooth without any tugging and made with organic ingredients, including sunflower oil and coconut oil. I’m sold on these! There are lots of balms out there in the green beauty world, but few actually glide on easily and stay on for more than three minutes. This is one of them. I received a sample of this cleanser ($11 for 2.3 oz) with my order. Good for two uses, it was lovely and smells very similar to the Chamomile Exquisite Cream. Though we were only briefly acquainted, it was great for removing makeup and having a therapeutic, calming experience in the shower before bed. Aloe barbadensis (Organic Aloe) Juice, Rosa damascena (Rose) Distillate, Persea americana (Avocado) Oil, Simmondsia chinensis (Jojoba) Oil, Emulsifying Wax NF, Organic Vegetable Glycerin, Elaesis sp. (Organic Palm) Oil, Palm Stearic Acid, Tocopherol (Vitamin E), Phenoxyethanol, Retinol Palmitate (Vitamin A), Rosa mosqueta (Rosehip) Oil, Ascorbyl Palmitate (Vitamin C Ester), dl-Panthenol (Pro-Vitamin B5), Allantoin (Comfrey), (Polysaccharide Gum), Argania spinsosa (Argan) Oil, Daucus carota (Carrot Seed) Oil, Salix alba (Willow Bark) Extract, Rosmarinus officinalis (Rosemary) Extract, Azadirachta indica (Neem), Tetrasodium EDTA, Citric Acid, Matricaria recutita (German Chamomile) Essential Oil, Anthemis nobilis (Roman Chamomile) Essential Oil, Boswellia carterii (Frankincense) Essential Oil, Calendula officinalis (Calendula) Essential Oil, Helichrysum italicum flower oil, Reiki Healing Energy & lots of love! Cucurbita pepo (Pumpkin), Vaccinium myrtillus (Bilberry) Fruit extract, Saccharum officinarum (Sugar Cane) Extract, Acer saccharinum (Sugar Maple) Extract, Citrus aurantium dulcis (Orange) Fruit Extract, Citrus medica limonum (Lemon) Extract, Aqua (Water), Vegetable Glycerin, Glycolic Acid, Tetrasodium EDTA, Tocopherol (Vitamin E), Phenoxyethanol, Limnanthes alba (Meadowfoam) Oil, Xanthan Gum (Polysaccharide Gum), Ascorbyl Palmitate (Vitamin C), Cinnamomum cassia (Cinnamon) Bark, Zingiber officinale (Ginger) Root Powder, Myristica fragrans (Nutmeg) Powder, Pimenta officinalis (Allspice) Powder, Rosmarinus officnalis (Rosemary Oleoresin), Azadirachta indica (Neem) Oil, Reiki Healing Energy & lots of love! Organic Sunflower Oil, Organic Beeswax, Organic Coconut Oil, Organic Vanilla Flavor, Vitamin E, Organic Rosemary Extract, Organic Calendula Extract, Reiki Healing Energy & lots of love! Aloe barbadensis (Organic Aloe) Juice, Decyl Glucoside, Cocamidopropyl Betaine (Coconut Source), Organic Vegetable Glycerin (Soybean Source), Lavandula spp. (Organic Lavender) Essential Oil, Anthemis nobilis (Roman Chamomile) Essential Oil, Calendula officinalis (Calendula) Essential Oil, Phenoxyethanol, Xanthan Gum (Polysaccharide Gum), Tetrasodium EDTA, dl-Panthenol (Pro-Vitamin B5), Reiki Healing Energy & lots of love! 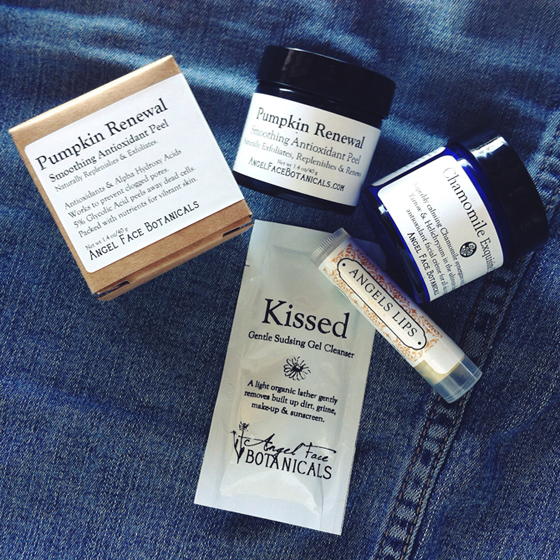 Now it’s your turn to try Angel Face Botanicals…nab two of my fave products in the giveaway below! It smells so good… really effective too! I’ve been using afb since 2008! I’ve tried nearly all the products over that time and have not been dissapointed yet! I love the rock star detox and Tahitian glow! The Chamomile Exquisite Cream has been a skin saver for me! A little goes along way with this stuff it’s worth the splurge. I haven’t tried their products, but I’d like to! You won’t be disappointed, Angel Face is the bee’s knees- so grateful I was introduced to the brand earlier this year… indulgent, affordable, and GORGEOUS! I’ve never tried them, but the Pumpkin Peel sounds awesome! I haven’t tried them yet, but I definitely want to get the Pineapple & Papaya Exfoliating Enzyme Mask. Sounds luscious, and it’s so affordable! Love it! I can’t pick which ones I like best because they are all so awesome! I haven’t tried this brand. well, jennifer, you know me and i am always on the look out for new brands and especially cleansers since my skin and i are also frenemies. haven’t tried this, but must add it to my list. ps- i made your diy toner today so i’ll have to give you an update in a week or so!